This lovely woodcut map by Sebastien Munster comes from his remarkable seminal work, the Cosmographia, or Cosmography as it is spelled here in German. Initially an academic who taught Hebrew at the University of Basel for more than thirty years, Munster had always had an interest in cartography and in fact published Ptolemy’s Geographia in 1540, and followed it with his own Cosmography, the first edition of which was published in 1544. This particular map is a pictorial description of islands and is designed to illustrate the text which accompanies it. Munster goes into some detail in explaining the physical appearance of islands, where they are more than likely to be found, and the processes by which they can be formed. 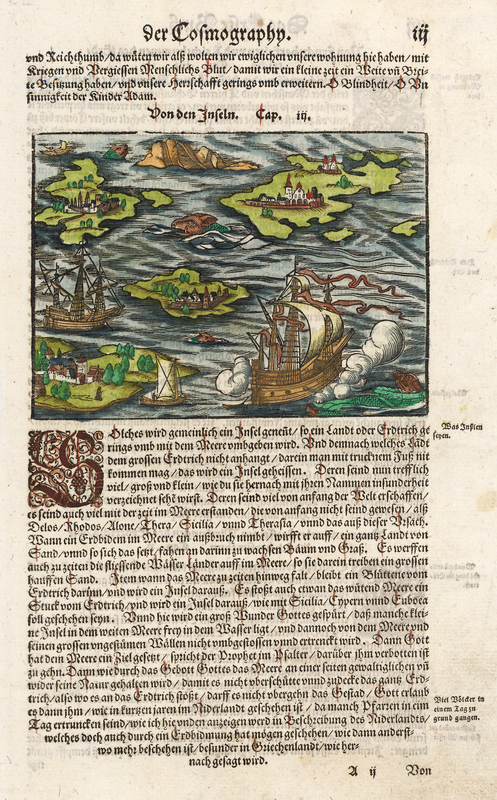 The accompanying text is in German, both above and below the map, and on the verso. The Cosmographia continued to be published for almost a century. It contained both up-to-date maps and views, and an encyclopedic range of information on the known - and unknown - world: it was probably one of the most widely read books of the time. He was also the first to produce separate maps of the four known continents, and the first separately printed map of England. Of the leading cartographers of the sixteenth century, Munster had probably the biggest influence in spreading geographical knowledge around Europe. Condition: This remarkable map in A condition is hand colored, with slight soiling along the right edge and lower right corner. Minor offsetting in the right border. 1625 Hondius his Map of Hispaniola, Cuba, &c.